The March edition of The Fairground Mercury has been posted to all current members of the FAGB. In this 40-page, full-colour edition Stan Savage and Pete Tei recall the splendours of the Kirkcaldy Links Market they encountered on a visit there half a century ago; Ross Jones describes some of the Lancashire Wake Fairs of his boyhood days; and Alan Ingram reports on the amusements in the SEC last Christmas. 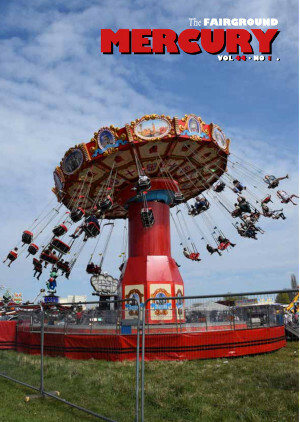 In addition, the fairground scene in Ireland at the start of the 20th century features in no fewer than three articles, one of them containing what may well be a unique and previously unpublished picture of William Toft’s Switchback Gondolas. As usual, Mike Willis lists the machine changes since our last edition, Doug Roseaman writes on modelmaking matters and a variety of members contribute to the Feedback section. We also pay tribute in words and pictures to three of our members who have died in recent months. If you would like to obtain this edition and the next three issues please send a subscription fee of £15 (OAPs and under 16s, £12) to Lynn Calladine, FAGB Membership Secretary, 29 Mill Street, Belper, Derbyshire DE56 1DT. Payment should be made out to FAGB and please enclose a small SAE for the despatch of your membership card. Should you be overseas please add a supplement of £5 to the subscription as a contribution to air mail costs. You can also pay by PayPal.